Your guide to understanding what homeowners insurance costs and how that cost is determined. Selecting a homeowners insurance policy is one of the more important purchasing decisions you’ll make after finding a new home. Homeowners insurance protects your assets — the home itself, personal property within the home, and legal and medical bills if someone is injured on your property. It's also required by most mortgage companies before they’ll lend to you. 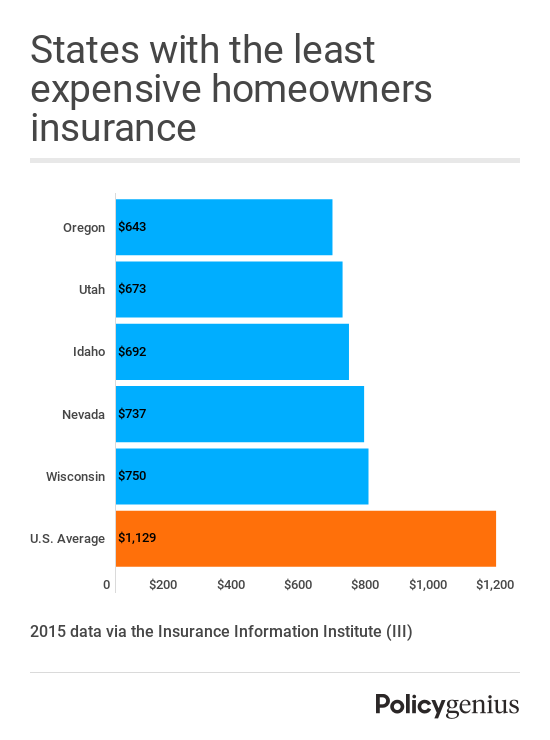 The average annual homeowners insurance premiums in 2015 were around $1,100 according to the Insurance Information Institute (III). 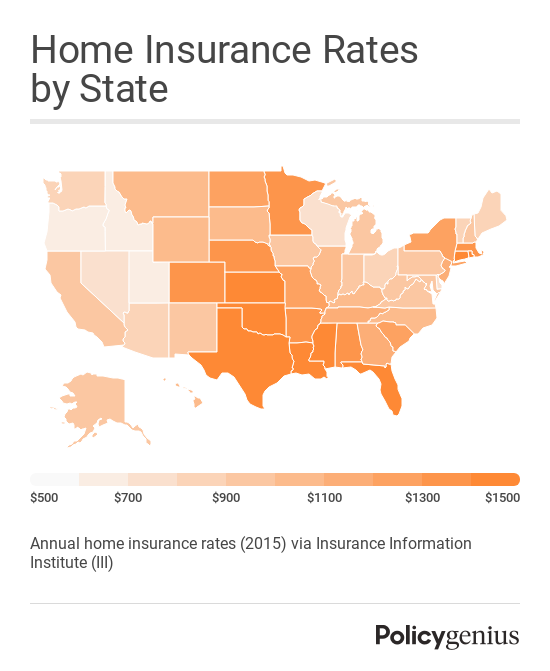 Homeowners insurance premium costs differ from state to state for a number of reasons. If a state has a lot of major cities and more densely populated areas, it’s more likely to have higher premiums, as home values are generally higher. States in areas with a higher incidence of natural disasters also generally have higher premiums than states that don’t match that criteria. Homeowners insurance premiums are also dependent on population density of your town or city, how old your house is, and how much it would cost to rebuild. What determines the cost of homeowners insurance? How much of each homeowners insurance component do you need? Extreme weather is a common theme in states with high homeowners insurance premiums. Florida, Texas, and Louisiana are coastal states and are more susceptible to strong storms, and Oklahoma and Kansas are right in the middle of tornado alley. On the flip side, you can get a bargain deal on homeowners insurance if you live in states that are sparsely populated and aren’t prone to extreme weather. Or maybe you just live in a state that averages a fire station for every six residents (fire station quantity and proximity can also affect how much you pay). 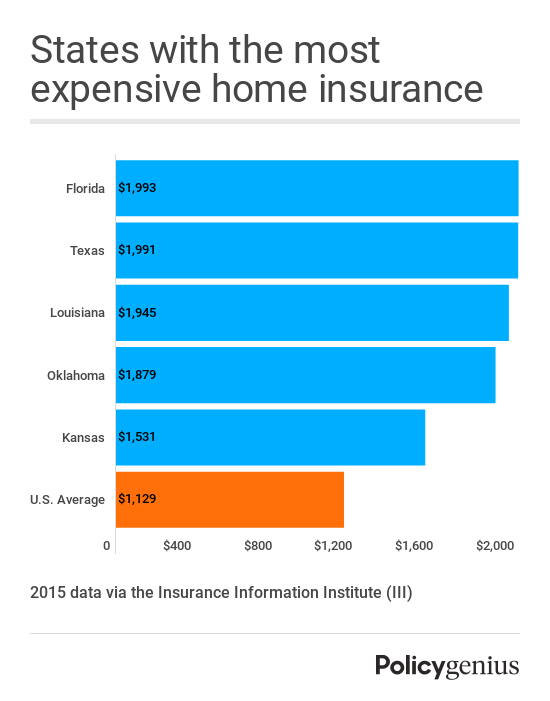 While we don’t advise moving somewhere strictly based on how high homeowners insurance premiums run, it’s helpful to understand why policies are cheaper in certain states and more expensive in others. As you can see, states with the lowest average premiums are inland and northern, so they’re not likely to experience tropical storms and not as at-risk to face tornadoes. Homeowners insurance companies factor in different kinds of potential risks when determining home insurance rates. Some of these risks you have control over, and some are simply beyond your control. Location: Location is one of the biggest homeowners insurance premium cost factors. Weather, population density, proximity to fire-prone forested areas or car accident-prone intersections and roads, proximity to a fire station, and insurance claim history (areas with a lot of home insurance claims have higher premiums) are all taken into account when determining rates. Credit history: Most states allow homeowners insurance companies to check an individual’s credit history to determine their premium. Age of your home: That Victorian house you just bought in a historic neighborhood may be charming, but chances are it has older wiring and plumbing, meaning your rates will be higher due to the heightened risk of fire and plumbing hazards. Homes with aluminum wiring are typically excluded from dwelling coverage unless proper safety modifications are made by a licensed electrician. Companies will also suggest a complete copper rewiring to minimize risk. Deductible amount: The amount you pay out-of-pocket in the event of a claim. Deductibles usually come in amounts of $500, $1,000, $1,500, $2,000 and $2,500. The general rule of thumb in insurance is lower deductible-higher premiums; higher deductible-lower premiums. Homeowners insurance discounts: Homeowners insurance companies offer numerous discounts and bundles that can lessen that premium. Its common for home insurance and auto policies to be bundled together; loyalty discounts if you’re with the same company for a set number of years; and filing infrequent claims or no claims at all typically rewards you with a pretty good discount. Dwelling coverage: Coverage for your home should equal the full replacement cost. Not to be confused with the home’s purchase price or market value, the replacement cost should reflect what it’d cost for a full rebuild. Other structures (garage, fences, driveway), personal property (personal belongings inside the home) and loss of use (covers additional living expenses if your home is no longer inhabitable) constitute a percentage of your dwelling coverage amount, as we demonstrated above. Liability coverage: Should be enough to cover legal fees, but financial assets — like the home itself, investments, and anything else with a dollar amount attached to it should be covered. If $500k isn’t enough (the maximum liability coverage amount in a homeowners insurance plan), you can add an umbrella policy to increase your coverage amount. Medical payments to others: The amount you’ll pay out if someone is injured in your home and requires medical expenses on your behalf. Policies should typically have anywhere from $1,000 to $5,000 in medical payments coverage. Learn more about what homeowners insurance covers. Another great way to lower your premium cost is to increase your credit score. Yes it takes time, but as your score increases, your premiums drop.